The brunch at SOMO SoPhi is offered five days a week and features scrapple, pork roll, and homemade English muffins. A newly opened South Philly restaurant is expanding the definition of brunch, offering the beloved meal a whopping five days a week and incorporating dishes heavy in Italian-American influence. The spot is SOMO SoPhi, which opened in the neighborhood at South 13th Street and Packer Avenue in late October. It's the second restaurant in the city under the SOMO name, the first opening on Manayunk's Main Street in 2017. The multi-level South Philly spot has been serving an mix of shareable, eclectic American dishes for the last month, but just launched its brunch menu going beyond most restaurants' weekend-only concept of brunch, instead serving it daily Wednesday through Sunday. In addition to five-day brunch, SOMO SoPhi is incorporating scrapple, pork roll, roasted long hots, and other dishes to reflect the Italian roots of the neighborhood. More traditional brunch plates such as eggs benedict, avocado toast, and fried chicken and waffles, among other dishes, are available, along with less typical items like the spicy pulled pork sandwich with fried green tomatoes or the Italian biscuits and gravy with broccoli rabe. The restaurant offers no less than 15 options for brunch sides, including house-made scrapple, roasted long hots, and house-made English muffin. 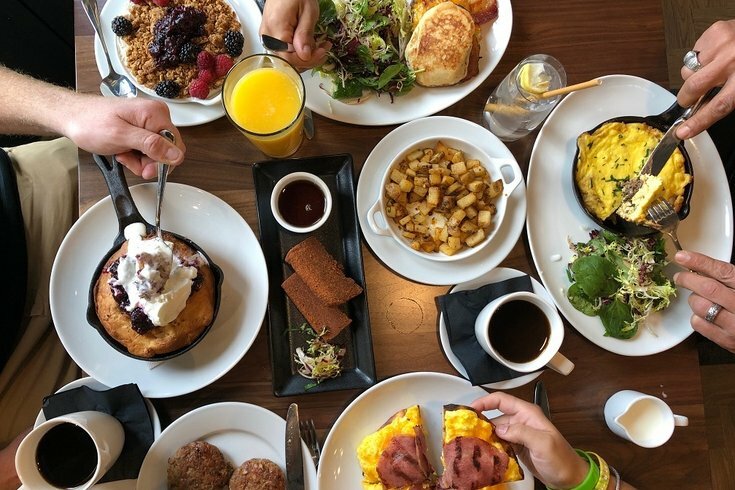 On step with some of Center City's buzziest brunch places, SOMO SoPhi also is offering a bottomless mimosa menu at brunch for $21 a person. Brunch service launched Wednesday and continues this weekend from 10:30 to 4 p.m. on Saturday and Sunday. For more info and see the full menu, visit SOMO SoPhil's website.